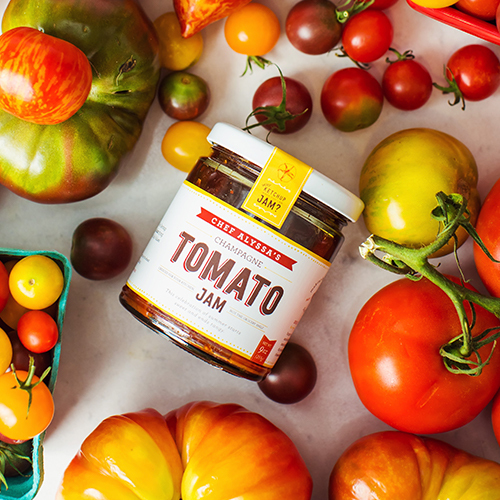 All-Natural and Preservative-Free. We promise you’ll recognize all of the ingredients. Note: Shipping is same rate for ordering between 1 and 4 jars. Drizzle veggies with olive oil, salt and pepper. Broil until tender and serve drizzles with the jam. The crispy edges of the vegetables pair really well with the tangy sauce. Warm cheese wheel in the oven at 375 for 10 minutes. 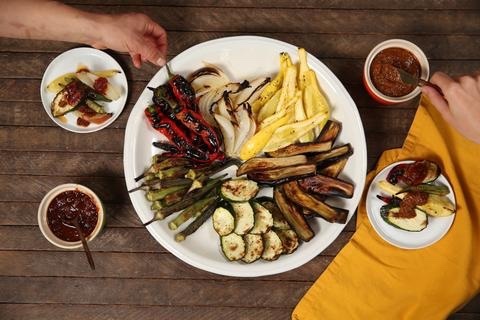 Serve warm topped with Tomato Jam. In a large sauté pan over medium-high heat, render the bacon. Once crisp, remove with a slotted spoon, leaving the fat in the pan. Place the halved Brussels sprouts flat-side down in the pan and cook until caramelized. Remove onto a tray and sprinkle with salt and pepper. Do this in batches if they will all not fit in an even layer in the pan and use additional cooking oil, as needed. 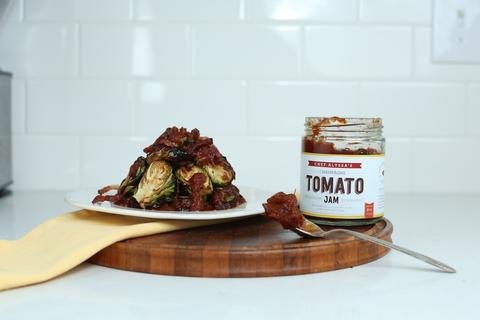 Serve Brussels sprouts drizzled with the tomato jam and garnished with crispy bacon and thyme.